Baltimore Mayor Catherine Pugh shared details of her arrangement with the University of Maryland Medical System regarding the controversy of her children's books, Healthy Holly. BALTIMORE, Md. 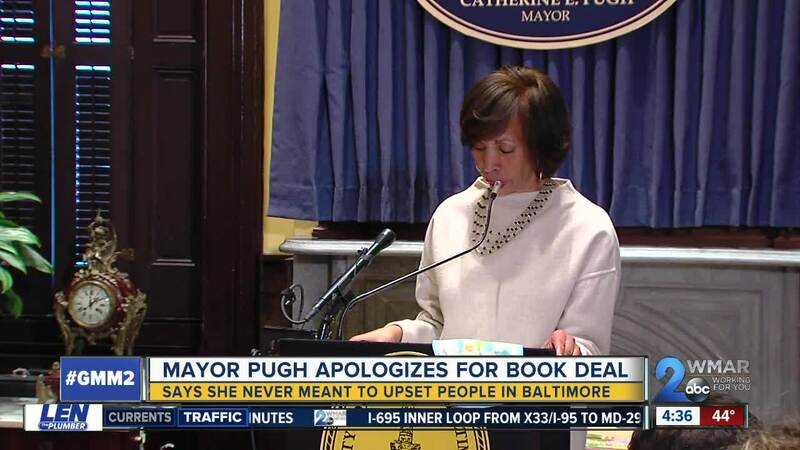 — Baltimore Mayor Catherine Pugh shared details of her arrangement with University of Maryland Medical System regarding the controversy of her children's books, "Healthy Holly." Pugh addressed the situation while recovering from pneumonia at a news conference Thursday evening. 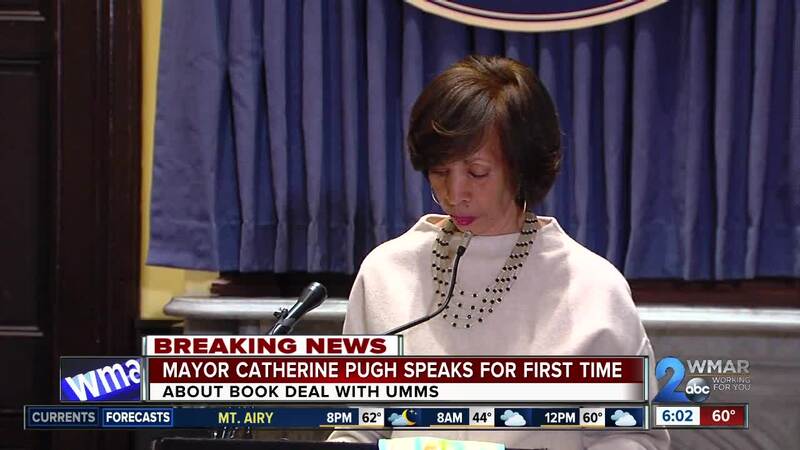 "I sincerely want to say that I apologize that I've done something to upset the people, the people of Baltimore that I love and care about and work hard everyday for," said Pugh. She wanted to clarify that the Healthy Holly concept was more than just the books, but it actually started as an initiative to promote a healthy lifestyle in hopes to eliminate obesity rates. "This shared mission is why I entered into this arrangement with the University of Maryland Medical System, there was never any formal contract," said Pugh. Pugh mapped out the timeline of her book series dating back to when she was inspired by a conference she attended in 2008 on childhood obesity. She says this led to her first published book in September 2010, at the time she was a delegate. She later shared the book with groups, children, organizations, and, in the midst of promoting the book, she shared it with a UMMS member. The member notified her that they liked the book and thought it aligned with their mission, hence the start to their collaboration to distribute the books to about 18,000 to 20,000 students in Baltimore City Schools. While showing a letter that UMMS sent to Baltimore City Schools' CEO Dr. Sonja Santelises, Pugh read, "As part of the mission of a health care provider the University of Maryland Medical System corporation will provide outreach benefits to address the health needs and priorities in our community. In essence, what they said, the medical system would make arrangements with purchase of the books." The mayor read the letter to the public and clarified that the intentions of the letter were stating the need to provide health outreach to children. She later goes on to say the document was accepted as something Baltimore City Schools could use, which led to the sale of 20,000 books at a cost of $5 each from UMMS to city schools. Pugh says the books were shipped in June 2011, according to her shipping manifest. Two years later, Pugh said 21,000 copies of Book #2 were ordered, 1,500 of them were shipped to her to physically promote the book within schools. And in March 2013, the remaining books were shipped to Baltimore City Board of Education to be distributed. In 2015, she said 21,000 copies of Book #3 were printed and 19,500 copies were donated to city schools, of which she personally obtained 1,500 copies to distribute. And in early 2017, copies of Book #4 of the Healthy Holly series were bought by UMMS for $100,000 which was delayed to ship. During the requested distribution of Book #5, the $100,000 payment was returned because of issues with the book's layout and the illness of the person who designed it. Pugh said those books will be distributed regardless of the return of the money. "Let me stress, the Healthy Holly initiative was never about the books, it was about a lifestyle," said Pugh. In the same news conference addressing the book deal with UMMS, Pugh debuted her baby clothing line designed for boys and girls as a concept that she plans to introduce within the Healthy Holly initiative. Pugh also showed a jump rope in hopes of implementing a jump rope contest to get children to exercise. Although she brought clarity to her intentions with her UMMS collaboration to distribute books, concerns from city residents and political officials continue to swirl. "I am deeply sorry for any lack of confidence of disappointment for which this initiative may have caused Baltimore City residents, friends and colleagues," Pugh said. "In hindsight, the arrangement with the University of Maryland Medical System was a regrettable mistake. I also want to apologize for causing any reputational damage to the University of Maryland Medical System." As we have indicated, City Schools has not located documentation of receipt of books. The shipping manifests provided today by Mayor Pugh had not been shared with us previously. We will review this new paperwork to determine if it may allow tracing shipments beyond the one staff members recall receiving.